from Maps of the city of New York / surveyed under directions of insurance companies of said city. from Maps of the city of New York. Pl. 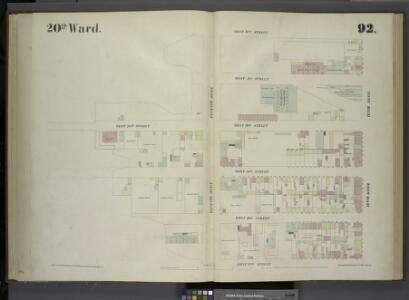 18: wards 16, 20.
from Atlas of the borough of Manhattan, city of New York. from Maps of the wharves & piers from the Battery to 61st street on the Hudson river and from the Battery to 41st street on the East river, New York. Surveyed by I.C. Buckhout, city surveyor. from Atlas of the city of New York, borough of Manhattan. From actual surveys and official plans / by George W. and Walter S. Bromley. Part of Section 3 : Plate 53. Part of Section 3 : Plate 58. From Atlas 42.55. Vol. 5, 1890. Plate 18, Part of Sections 3&4: [Bounded by (Hudson River Piers)Twelfth Avenue, W. 41st Street, Eleventh Avenue and W. 34th Street. Part of Section 3 : Plate47. Part of Sections 3 & 4 : Plate 63. Description: from Maps of the city of New York / surveyed under directions of insurance companies of said city.